Living in Colorado and being self-employed, I have ample opportunities to backpack. There are over 700,000 acres/280,000 hectares of public land bordering my 71-acre/29-hectare "backyard" in addition to all the other gorgeous locations which abound in Colorado. Over the past 15 years, my husband John and I have also had the good fortune to hike/snowshoe glaciers, rain forests, mountains and deserts in exotic locations, including New Zealand, Iceland, Costa Rica, Slovenia and Death Valley. 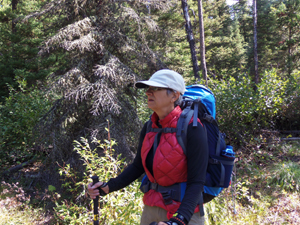 My hiking style is comfortable, aiming for lightweight. I use a tent (rainfly if needed). Current pack averages 25 lb (11 kg) excluding food and water. The Mountain Equipment Eclipse Tee is not like any other "tee shirt" I've ever worn! It's more like a long-sleeve thermal base layer top. 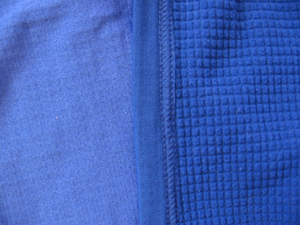 The material, rather than being traditional flat-stitched tee-shirt cotton or some sort of cotton/synthetic blend, is a thin waffle-like fleece. The sleeves are long and have thumb loops to hold them in place over the tops of my hands. There is a bright colored 10-inch (25 cm) zipper, making it easy to put on and to vent when needed. A stand-up collar covers up most of my neck. And a Napoleon (chest) pocket is sewn into the left chest. The Eclipse is structured for a close fit with lots of seams and interesting gussets to follow the athletically-built body. Since I received the Mountain Equipment Women's Eclipse Zip Tee, I've been in locations as diverse as the Canadian forests, the Colorado mountains, Utah canyons and of course, lots of local high desert terrain in south central Colorado. On one two-week trip in early September, I managed to "hit" two Canadian provinces (Alberta & British Columbia) and five USA states (Colorado, Wyoming, Montana, Idaho & Utah). Terrain was everything from dry desert to lush forest to rocky mountain trails with a lot of streams to rivers and alpine lakes in-between. A lot of my backpacking in early autumn 2015, involved fishing. So even when it wasn't wet from the weather, I was in or around water. This means I experienced way more humidity than I normally do on my backpacking forays. Also, the vegetation was very "bushy" in Waterton and Glacier National Parks, with more deciduous trees rather than the shrubby pine and juniper I am used to as well as the lack of cholla cactus and prickly pear cactus that are so hard on my clothing. In late August/early September 2015, most of time it was very hot, unseasonably so, but I was able to wear the Eclipse on a couple of very cool - 28 F (-2 C) one morning - days as well. 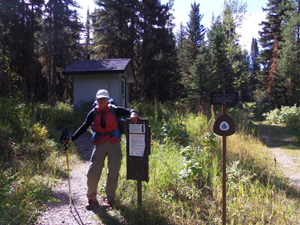 And while most of my day hiking was in pleasantly sunny weather, I did not fare so well on our long-awaited big backpacking trip to Waterton and Glacier National Parks. There it was almost constantly overcast at best the entire two weeks. And when it wasn't drizzling, the sun was dimmed by all the wildfire smoke from fires burning in both countries. In early October I wore the tee on a one-week trek in New Mexico in the Lincoln National Forest and the White Sands National Monument. Most of the time it was either foggy, misty, drizzly or downright, rainy! I think we had only one day where it was hot and sunny. I spent 10 days in the northern part of the Lower Michigan peninsula during a Thanksgiving Day trip in late November. There was lots of hiking in snow and rain. I don't think we saw the sun the entire time we were there. Temperatures hovered around the freezing mark with lots of wind to make it feel even colder. All of my snowshoeing and hiking was done on dirt, heavily pine-forested trails with a backpack never weighing more than 20 lb (9 kg). Fortunately, between all the horrible weather elsewhere, most of my winter time in Colorado was bee-u-ti-ful! We had lots of sunshine, little precipitation and for the most part, the temperatures were above normal. Daily "highs" averaged between 50 and 75 F (10 - 24 C). In addition to my daily hikes in south central Colorado - Canon City, where I call home - I wore the Eclipse tee on several snowshoes in Rocky Mountain National Park and in the Wet Mountains. The Eclipse fits me just the way I like a base layer to fit. It is not so tight as to constrict but it is form-fitting enough to hug my body. I can easily wear loose mid-layers over the Eclipse and still move about freely. The fit is great for sleeping in, too. I don't get tangled in excess fabric but still can squirm around. The sleeve length is just slightly over my wrists and has thumb loops. I'm not a fan of sleeves I can practically pull over my fingertips. That means excess bulk. Conversely, I don't like too-short sleeves which leave my wrists exposed, particularly in cold weather. With the thumb loops I'm able to cover the tops of my hands and even more importantly, able to slide my gloves over the cuffs to thwart icy winds. With "athletic fit" in mind, there are a LOT of seams. They are flat-locked stitched and positioned in such a manner that they are not irritating even under a shifting backpack. The stand-up collar seam is tucked inside so no stitching rubs my neck. I did cut out the Mountain Equipment tag and a hang loop at the collar though. I'm not a fan of neckline protrusions. Now, once I pull the Eclipse down and tuck it into my pants, I totally forget I have it on. The 10-inch (25 cm) front zipper has a small corded loop pull with a plastic-like end for easy opening and closing even with my gloves on. I used this zipper a LOT. I'm constantly opening and closing it to vent or warm up as needed. Happily, the zipper moves smoothly and has never caught on the interior storm flap. The same smooth action applies to the 5-inch zipper for the Napoleon pocket on the left side of the Eclipse. Though I didn't use that pocket much as it is rather small (6 x 3 in/16 x 8 cm) - big enough for my mp3 player, (but it doesn't have a port so that's not useful) and not big enough for my cell phone. The best fit feature of the Eclipse is the generous length. It rests a good 6 in (15 cm) below my waist, covering my hips and most of my bottom. Once tucked into my pants, the Eclipse stays put, too. I like that! The inside of the Eclipse is a waffle-like textured fleece which is not the softest interior I've ever worn, but is not scratchy. I have found it to be an excellent insulating layer in the cold. I have had very good experiences wearing the Eclipse as my first layer with an additional layer (down vest), and a windproof jacket. I've also worn it without the vest and solo without a jacket as well. This depended on the weather, of course, and what my activity level was. 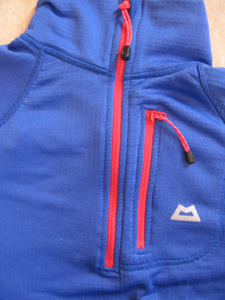 Mostly, I would start out with three layers and then strip the jacket off first, then the vest as I heated up. When snowshoeing, I actually usually end up with just the Eclipse on anytime the temps rose above 40 F (4.4 C). Sweating is something I manage to do even in the coldest weather when snowshoeing or gaining elevation rapidly. Wearing the Eclipse, I found I was not having the soaked-shirt-syndrome underneath my pack. I don't mean to say the Eclipse wasn't wet, it was. But the wicking worked so well, I was not aware of being wet. Feeling the inside of the Eclipse with my hand, the fabric felt cool, but dry. Touching the outside of the Eclipse was a different story, the fabric was definitely wet! Unlike a lot of my tops I have, as of yet the Eclipse has not shown any signs of pilling or fabric weakening from the friction caused by the straps and hipbelt of my pack. According to the nice soft care tag which is sewn into the left side seam of the tee, the tee should be washed at 30 C (86 F), not bleached, tumbled dried, ironed or dry cleaned. It is recommended that fabric softeners and detergents be avoided. Uh-oh. Maybe I should have read these instructions before writing this review and wearing and washing the tee for the last 8 months? While I nailed most of the first line of instructions (as I listed above), and I did not use fabric softeners (never do), I have to confess the tee saw its share of detergent (plain old everyday powered HD detergent) and it also was tossed in my electric dryer on the "gentle" cycle more than once. No worries though, my abused tee still looks great and hasn't shrunk, stretched out, become misshapen or pilled! However, now that I'm educated in the ways I should be caring for my tee and since I really want it to stay functional in my backpacking wardrobe for a long time, I will be more careful to use tech wash instead of detergent and line dry the tee instead of machine drying it in the future. As of right now, the tee is in stellar condition with no rips, snags, pulled threads, stains, or stuck zippers. I'm really happy with the Mountain Equipment Eclipse Tee. 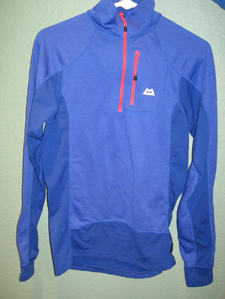 It is a really good base layer for me and I am very pleased with how well it held up through a lot of wear over the winter months. But just because the calendar says it's "spring" doesn't mean I will be folding the tee and putting it away for the summer. As a matter of fact, I just folded the tee and packed it into my pack for my upcoming trip to Glen Canyon in Arizona next week! I can certainly recommend this tee! This report was created with the BackpackGearTest.org Report Writer Version 1.5 Copyright 2016. All rights reserved.